Description: Body brown, head grayish, with a white crown and green face patch. Green speculum. Flashing white forewing distinguishes species. Female has finely flecked grayish head and drab brown body. 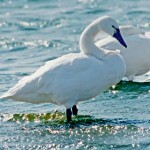 Habitat: Migration – sometimes found on large lakes or reservoirs. Breeding – marshes or lakes with food near or at the surface, especially those that have adjacent sedge meadows and partly wooded areas nearby. Where in Nebraska: Common, locally abundant spring and fall migrant statewide. Uncommon regular breeder in north-central and north-west Nebraska. Uncommon casual winter visitor throughout the state. 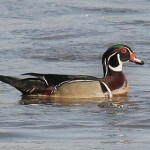 Nebraska Seasons: Best time for viewing American Wigeons is in late May in south-central Nebraska. 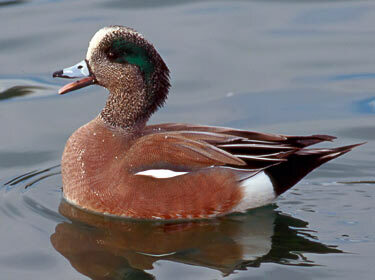 Fun Facts: American Wigeons have a diet that consists of the most plant material than any other dabbling duck. 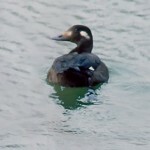 Additional Information: Commonly called a Baldpate due to the white crown.